Though true angora fiber is from the hair of the Angora rabbit, because more than one animal bears the name "angora" some confusion exists regarding what really is angora fiber. Angora rabbits produce angora fiber, and Angora goats produce mohair fiber. Angora also differs from rabbit hair, which is the fiber obtained from the common rabbit, in that angora is longer and more flexible and better suited for luxury textiles. Each rabbit produces ten to sixteen ounces of luxuriously soft fiber per year. The rabbits are clipped with a pair of scissors, sheared with electric clippers, or plucked by hand when the hair is three to five inches long. Plucking pulls the loose hair from the rabbit and produces the highest grade of angora wool because of the spiky fur-like quality it gives to the fabric. Some countries regard plucking as inhumane and have outlawed the practice. Angora fiber differs from sheep's wool in several ways. Unlike wool, angora fibers do not have scales on their surface. This lowers the risk of shrinkage from felting (the permanent interlocking of the fibers) and makes the fibers slippery. Angora fiber's diameter is very fine, approximately 11 microns (1/25,000 of an inch). Only the finest wool is similar in diameter to angora. Angora fiber has a low density (weight) of 1.15 to 1.18 grams per cubic centimeter, compared to 1.33 for wool. Angora fibers have little elasticity, making them difficult to process into yarn. Wool, on the other hand, is very elastic because of its crimp and molecular structure. Blending angora with wool helps make spinning easier and helps to hold the angora in the yarn structure. During a garment's life, it is normal for short angora fibers to work their way out of the yarn and shed from the fabric. Angora's small diameter fibers have air-filled chambers that give them warmth without weight. The fiber transmits moisture readily, so garments feel dry, warm, and comfortable. Angora's properties are of value not only for fashionable garments, but also for therapeutic garments designed for people with joint diseases. Garments featuring angora fiber include knitted sweaters, hats, gloves, and underwear for fall and winter-wear. The highest quality commercial angora fiber is white, but the fiber is available in other beautiful colors including pure white, gray, fawn (a light grayish brown), brown, and black. Angora does not take dye well, so the dyed fiber usually has a lighter color than other fibers in the blend. There are five grades of angora fiber. The first four require the fiber to be white, perfectly clean, and without tangles or mats. The lengths vary according to the grade: grade one, the top grade, is 2 to 3 inches long; grade two is 1.5 to 2 inches; grade three is 1 to 1.5 inches; and grade four is any length. Grade five is of any color and can be soiled and matted or unmatted. Naturally colored angora fiber is generally found in garments produced by small-scale manufacturers. 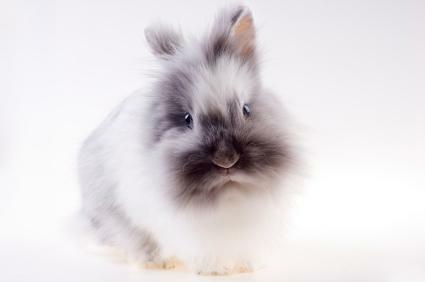 Angora rabbits were originally raised in North Africa and France. In the early twenty-first century, 90 percent of the world's production was from China. Other countries producing angora included Argentina, Chile, Hungary, France, and India. Spalding, K., and C. McLelland, eds., Angora Handbook. 2nd ed. Morgan Hill, Calif.: Northern California Angora Guild, 1991.